As I've travelled across the country this spring, I've stayed at many RV campgrounds. This one, is by far, the nicest! I hadn't read the reviews before I came here, and went merely on the rate, which was much more reasonable than other parks in the area. When I pulled up, I couldn't have been more pleased. The owners are kind and helpful, they have such a personal touch that you feel you have come to stay with family. There were some wonderful and amazing amenities. Beautiful woodcarvings around the park, landscaping that covers up the standard electric posts and gives both privacy and a personal feel to each site. Then there is the free lending DVD library. Just borrow and return from an extensive list! Need fresh veggies? Check out the garden and take whatever you like. I was begged to take as much spinach as I wanted for fear it would go to seed. The bathrooms are immaculate and they have puzzles going in the laundry room. I would stay here forever! We have been coming to this park for many years. It recently changed hands and this was our first trip since the change of ownership. When the new owners took over, they had big plans for improvements, but based on this stay, very little has changed. First of all, I requested a site at the top of the hill. These sites are in the open, and have good satellite reception. When we arrived, we were told that a group had all the sites and we were stuck in a site at the bottom of the hill with no reception. The park has no cable, so we had nothing. Also, they advertise wi-fi at all sites, NOT TRUE! we had no wi-fi except if we went to the clubhouse. All in all, we will not be coming back to this park! We are sorry for your experience, and that you didn't find any of our improvements. We have done things each year and continue to strive to do so. We work hard to accommodate site requests, but groups usually book a year in advance, so if you had asked for a specific site we should have mentioned its unavailability at that time and we are sorry for any miscommunication. As far as the Wi-Fi, we advertise basic Wi-Fi, but we don't say every site just because there are variables that can come into play to change that (Tall RV's in line of site, computer antenna strength etc.) Most RV's have the best access with a Wi-Fi booster in their RV. We hope you would choose to come back again, and if you do, we can book by area, so be sure just mention the area you would like so we can let you know in advance if there are openings. If you like the upper area, after our septic upgrade is complete, we hope with county's favor to make more sites behind that area with satellite access. Kind regards, Chris ~owner. I stay here when I visit my son's family. The staff are the best and are willing to go the extra mile for you. I stay in the off season for at least a week. It is quiet and the grounds are clean. WIFI is spotty and very weak in the two areas we stayed. Cell service is good away from the entrance sites which have no service. Overall I see improvements with each stay. The owners are doing their absolute best and want you to enjoy your stay. I would absolutely stay here when I am in Port Angeles. We accepted Overflow when we made the reservations so we ended up in a gravel parking lot without sewer for 2 weeks. However they had a pump out service and the site was very good size. An excellent place for traveling the Olympic peninsula and taking the ferry to Victoria. Wifi was spotty and no cable. Few channels OTA. The owners were outstanding! I would stay there again (in a regular site). Very nice Park. Lots are terraced so easy to level. All sites had a picnic table, and grass. Very quiet and peaceful. Owners even have a veggie garden and you can help your self to anything that's ready. Will definitely stay here again. We always enjoy staying at this Good Sam Park. The family is so nice and helpful. We were escorted to our site by one of the sons on their bike - very courteous and made sure we knew everything. The store is a pleasure with unique handcrafted product as well as RV supplies. The park is very clean and well landscaped. The bathrooms/laundry and rec hall area are beautiful. 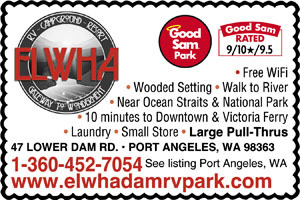 This is a great place to stay for ferry crossings and to visit Port Angeles area. We really enjoyed the stay - we had a big rig site that was just perfect, nice and level and spacious. We would definitely stay again. Campground is set in the forest, with hilly terrain. Our site was spacious, but big rigs might find it a little tight. Very friendly staff. Centrally located near Port Angeles and Olympic NP. Would stay there again. Nice park. There are "resident" campers . Spaces are cramped but nice location. Restrooms are in need of updating but clean. Nice trails around park and to the old dam site. Very nice hosts. This is the best commercial campground we've seen in 6 months traveling. Everything works, is well maintained. Beautiful new restroom and laundry facilities. Some of the sites have a little privacy (like the one we're in). The location is amazing for visiting Olympic Peninsula highlights. Owners very friendly and helpful. What a great visit! They've worked hard on this place and it shows. Stayed at this park for two days in mid June. Pros: -Very friendly Staff. (This park is privately owned by a family which lives on site and maintains the park.) -Nice website listing information about park. -Large grassy areas to play in or walk dog. -Things for kids to do: Basketball, horseshoes, and volleyball. -Clean well maintained restrooms! Cons: -Extremely slow wireless internet. (May be fixed by the time you read this. They related that an upgrade for their system is scheduled for early July.) -Can hear traffic noise from highway. Quiet Hours at park are not enforced. -Some spaces are VERY narrow. These are the overflow area where (unfortunately) we stayed. With slide-outs extended, there was not space to walk between RVs. Like two feet of space between our side-out and neighbor RV. So if you have a larger rig, view website and make sure you get one of the spots that allows you plenty of room. Not all sites are equal here. Some places have nice view and space, others not so much. NOTE: Owners are constantly improving this park. They seemed very interested in visitor feedback and willing to make stay more comfortable and provide information when requested. Greetings Oregon Adventure, Thank you for your review. We must have missed the loud happenings during your stay and apologize, we actually do enforce quiet hours. The overflow sites at that time were just put in and a few RV's ended up parking over what should have been their allotted space. A few adjustments have helped a little and have seeming to go more smoothly. Even so, we are prefacing these sites before booking them. Our utmost goal is for visitors to have the best possible experience ever while here on the Peninsula where ever they end up. Since we didn't meet your expectations, we would love the opportunity to give back the value you deserve. Just give us a call. Kind regards. The new owners are just wonderful and are very friendly and helpful. 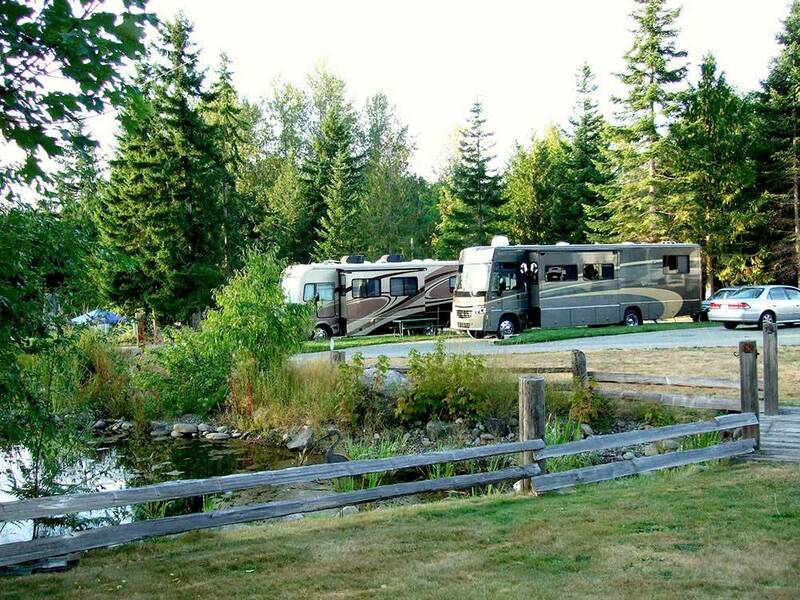 Great Rv sites to set up in. Everyone obeyed the speed limits in the park making it safe for the children to walk around the park and to the pool. Beautiful location and wonderful hosts. Everything was exceptionally clean and the staff are well informed on local attractions. Great Weekend retreat for us we are about 1.5 hours away, Owners want to please and they do ! Great base camp to do some exploring. Grand Daughter loved going to Salt Creek and exploring the tide Pools. It had been 20 years since we went to the Hoh Rain Forest but it was just the right day trip. Campground was an Oasis of quiet. Showed my Grand Daughter an Old dude can still play a mean set of Horse Shoes. Lots of places to Hike and the old Dam site is cool to see how it is coming back to nature. Pull through spots where a little tighter than I would have liked but overall a very nice park. Our site was close to where they let their Horses run, my Grand Daughter is big into horses so she was smitten. This one I know I will be taking short hops to recharge the batteries often.